It was a mixed month for world equity markets, with net monthly changes ranging from +6.2% (Brazil), +4.9% (UK), +1.8% (USA), -0.3% (China), to -1.6% (Spain). It was a broadly bullish year, with net yearly changes ranging from +26.8% (Brazil), +25.1% (USA), +12.5% (Germany), +7.6% (UK) to -0.02% (Russia). The mighty Dow settled higher for a NINTH consecutive month, +446pts (1.8%) to 24791, which made for a powerful net yearly gain of 25.1%. December saw a new historic high of 24876. Best guess: there is threat of some cooling in Jan/Feb' of 3-5%. Ironically, that would merely make for a mini washout, before another major surge across the spring/summer. Next key fib' level is 26702, which is 8% higher. At the current rate of increase, 30k is a valid target for 2018, with a secondary key fib' of 34430. Equity bears have nothing to tout unless a bearish monthly close. For me, that would equate to a monthly close under the key 10MA, currently in the 22200s, and which is rising around 400pts a month. So, from June 1st onward, the 26600s will be 'technically' on offer. 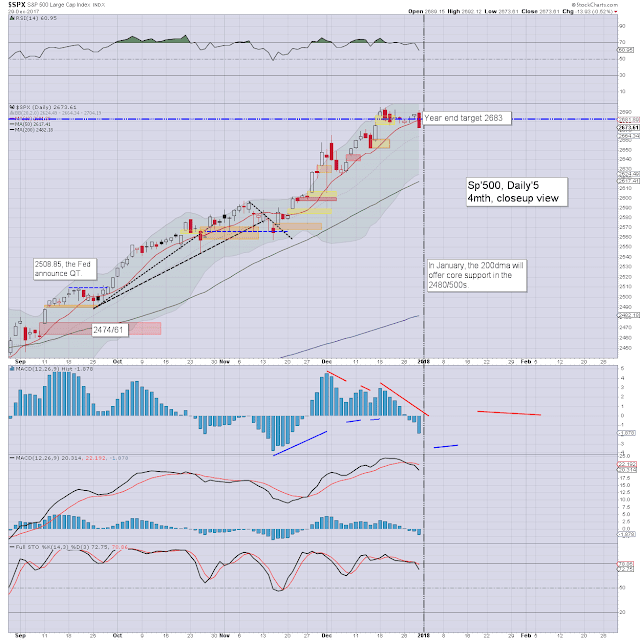 I do not expect any bearish monthly closes in the near/mid term. The economic powerhouse of the EU - Germany, saw the DAX settle -0.8% to 12917, but this still resulted in a net yearly gain of 12.5%. The 10MA is holding as first technical support. Upper bollinger will be offering the 14000s in early 2018. Core support is around 11k, and that looks secure. It would really help the financials - not least Deutsche Bank, if the ECB raise rates at least once in the latter half of 2018. Right now, Draghi is showing zero sign of doing that. If the Fed raise rates another 2-3 times by autumn 2018, the ECB will be under severe pressure to begin normalisation. 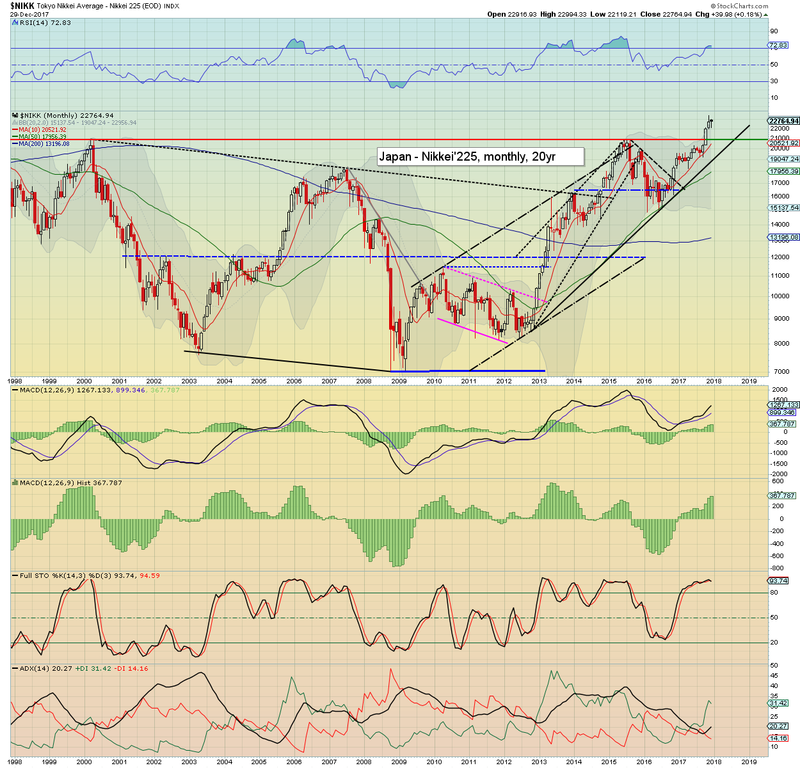 The Japanese market climbed for a fourth month, +0.2% to 22764, which made for a net yearly gain of a very powerful 19.1%. 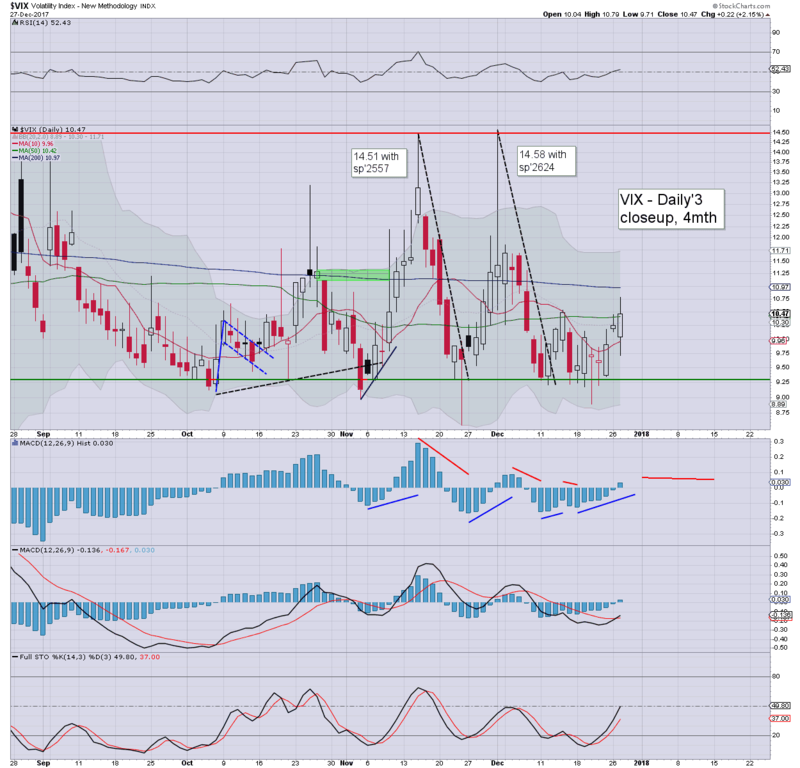 Most notable this year was the sustained break above key resistance of 21k. Next stop is 25/26k. I'd imagine the printing staff at the BoJ are very pleased with their work this year. Some babies would also help, but there will be fewer of those in Japan in 2018, than this year. The Chinese market leaned weak into year end, settling -0.3% at 3307, but that still resulted in a net yearly gain of a reasonable 6.5% There remains very powerful resistance within the 3400/500s. 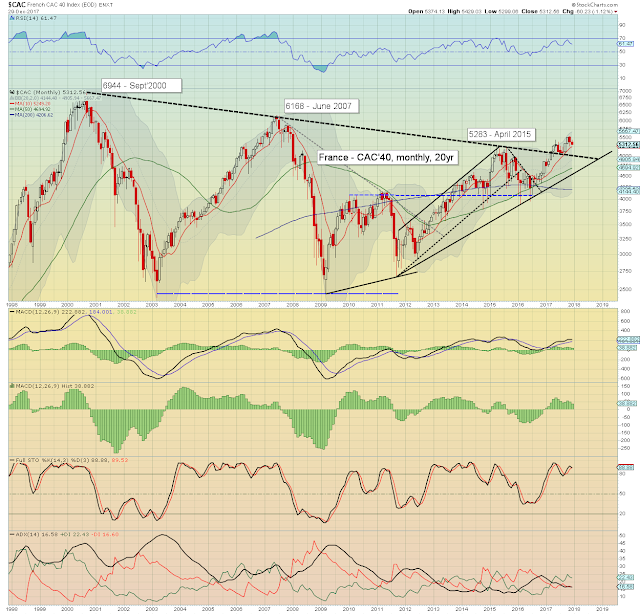 An eventual upward break is probable, and that will offer 4500 by late 2018.The communist leadership would clearly like higher prices to placate the populace, but they are understandably concerned about a bubble similar to 2015. No doubt, the PBOC will be busy across 2018. The Brazilian market was higher for the 6th of 7 months, settling +6.2% at 76402, making for a very powerful net yearly gain of 26.8%. Note the December close is above the May 2008 high, which gives confidence 80k will be seen by mid 2018. More broadly, 100k is on the menu. 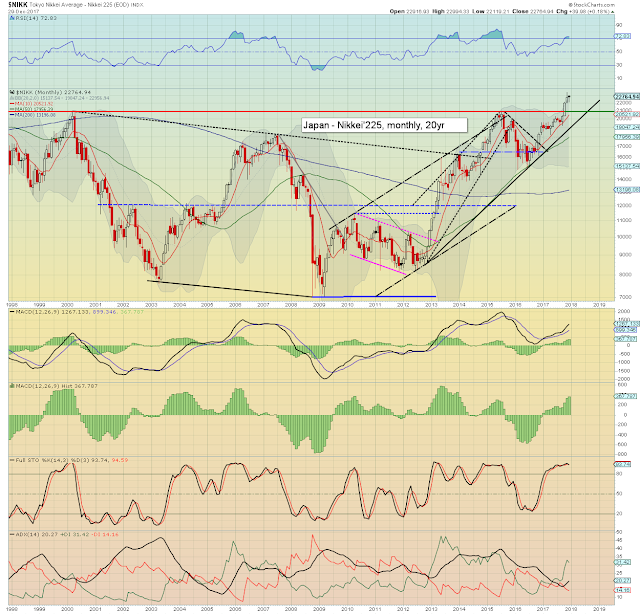 Clearly, that will require sustained/significant strength in commodities... which itself seems probable. 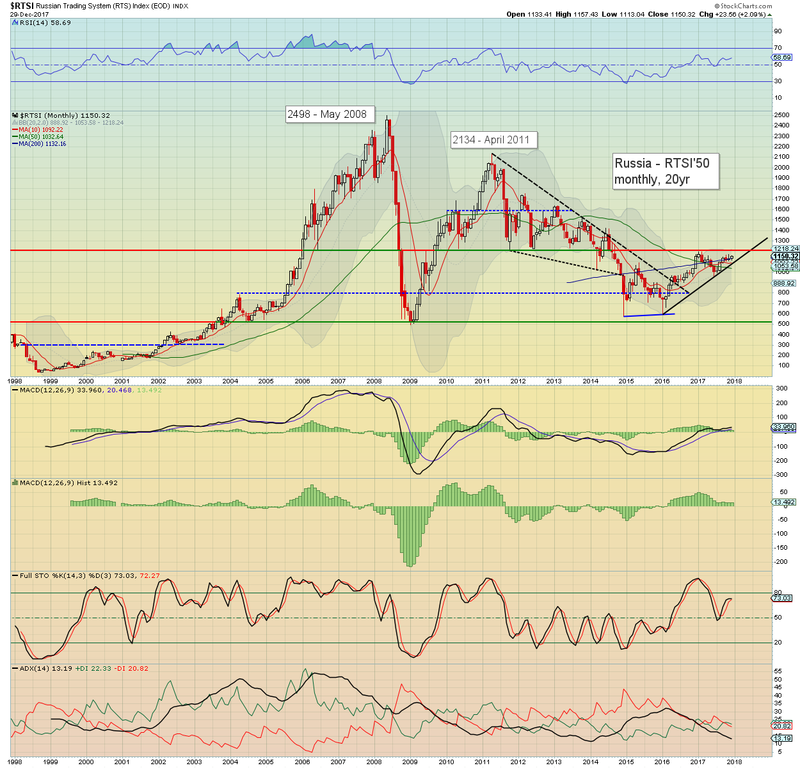 The Russian market climbed into year end, settling net higher for December by 2.1% to 1150.32. This was 2.1pts (0.02%) below the 2016 settlement. There is a clear upward trend that began in Jan'2016. A break above the 1200 threshold will offer a major push to the 1500/600 zone in 2018. 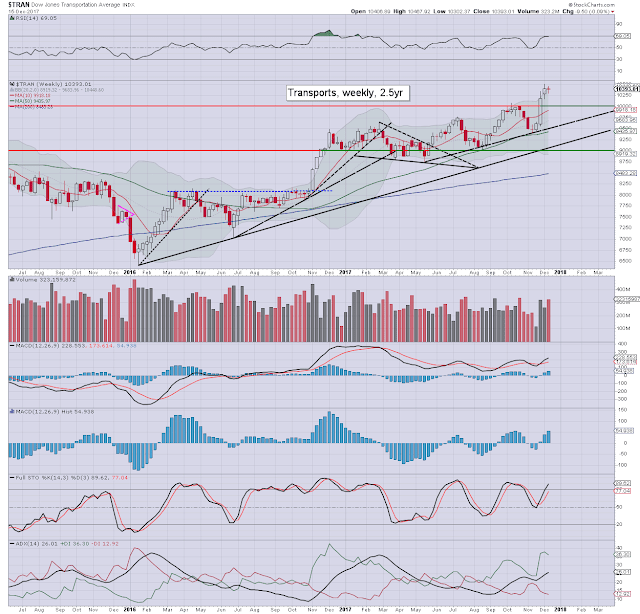 Some commodity price inflation (especially oil and nat' gas) would really help inspire such upside. The UK market ended the year on a particularly bullish note, settling +4.9% to 7687, with a notable new historic high of 7697. Price action across 2017 has been very choppy, but its extremely important to recognise that old multi-decade resistance of 7k, is now confirmed support. The 8000s are clearly coming into the spring. More broadly 10k is a valid target for end 2018. 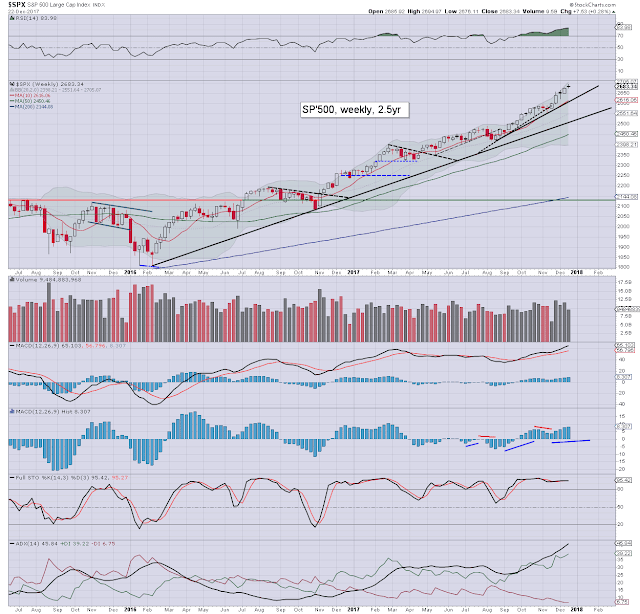 The hyper bulls should be seeking 14/15k before maxing out. The natural low in the next bear market would be no lower than 7k. The French market settled lower for a second month, -1.1% to 5312, however that still resulted in a net yearly gain of a very significant 9.3%. 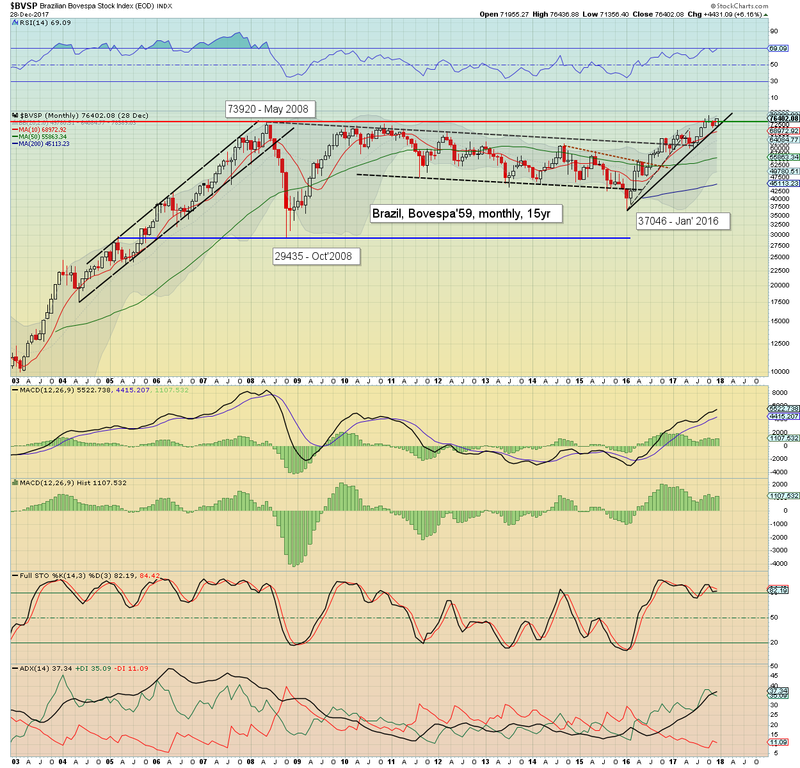 The most important aspect this year was the break of declining trend that extended back to Sept'2000. We saw a text book breakout, then a back test, with a new high in Nov' of 5536. 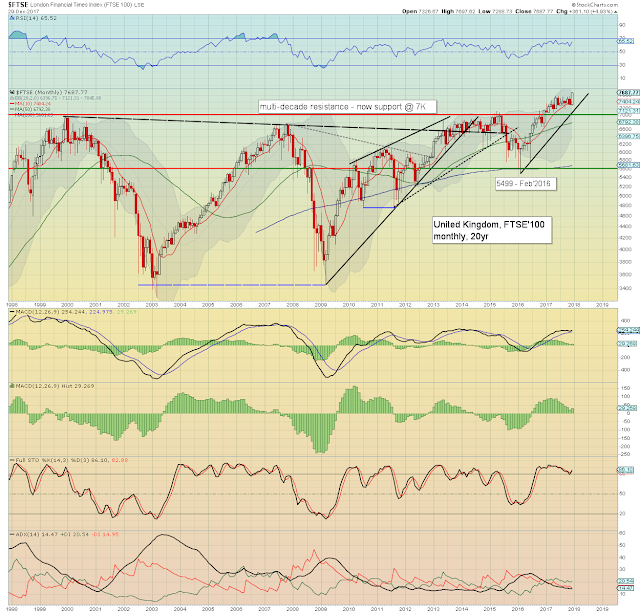 Next soft target is the June 2007 high of 6168. 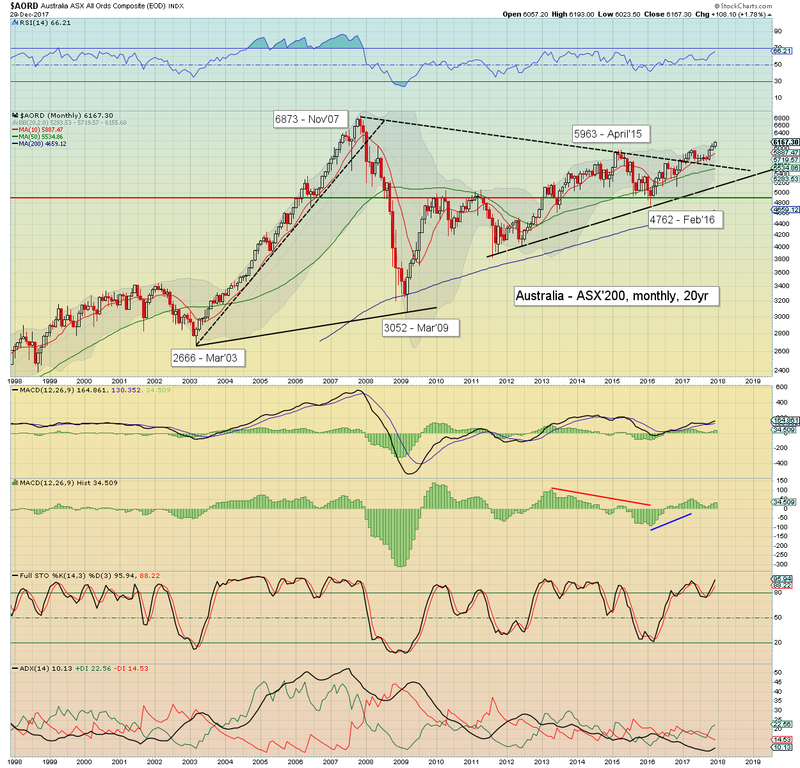 That seems a valid target for the summer, with viable new historic highs (>6944) before end 2018. Will Macron copy Trump, and start to tout the strong equity market as a sign of his 'inspiring leadership'? The Spanish market settled lower for a second month, -1.6% to 10043, but still making for a respectable net yearly gain of 7.4%. 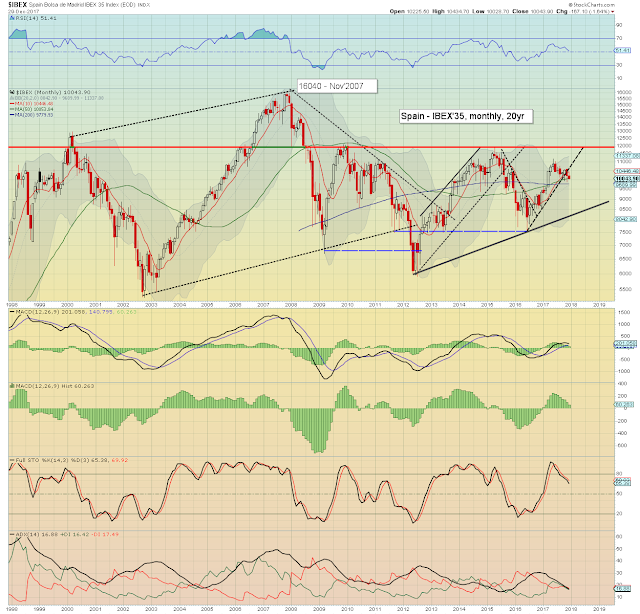 Its notable the IBEX peaked at 11184 in May, and then declining by -10.2% across eight months. The 'Catalonia situation' was obviously the core reason for the choppy cooling. 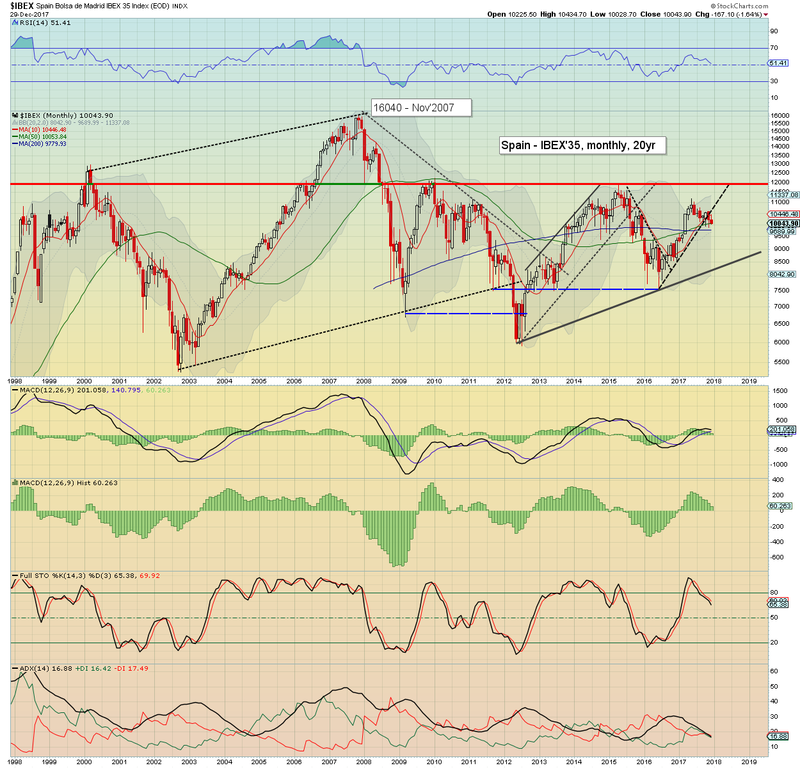 Spanish equity bulls should be desperate to see a break above multi-year resistance of 12k. If that can be achieved, it will open up grander upside to 15/16k in 2019/20. As one of the infamous 'PIIGS', it does remain the case that the Spanish economy has underlying structural problems. For now, things are ticking along, but the next recession would cause particular social unrest, and re-ignite the Catalans, who are seemingly content to just let things drag out for another few years. The Australian market settled higher for a third consecutive month, +1.8% to 6171, making for a net yearly gain of 7.9%. Price action is similar to the French market, with an important break of multi-year declining trend, a back-test, and then another push upward. Next soft target is the Nov'2007 historic high of 6873, which is 11.4% higher. That does seem on the menu within 6-9mths. Commodity price action is going to be particularly important to the Australian economy/market in 2018. A mixed December, with 6 markets net higher, and 4 net lower. Brazil, USA, and the UK are leading the way higher, whilst Spain and China are lagging. A broadly bullish year, with 9 of 10 markets significantly higher. Only the Russian market saw a fractional net yearly decline, but even that looks set to break above key resistance in early 2018. Most markets are offering basic upside of 10% by mid 2018 (including the USA). 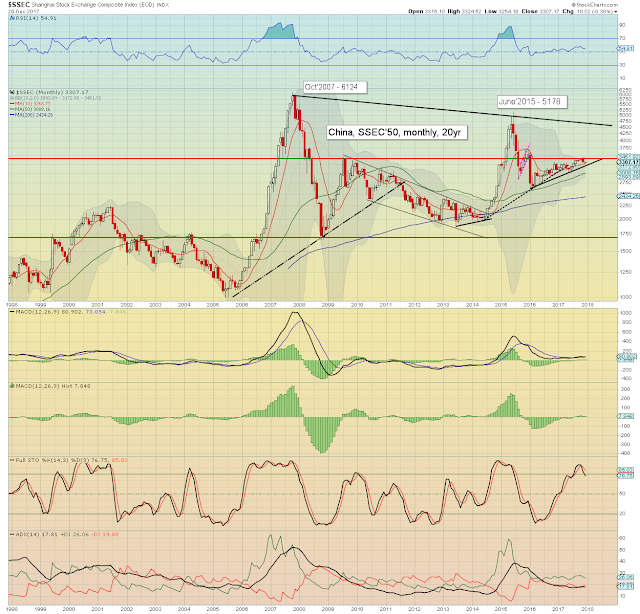 If commodity prices pick up - as seems probable, then the rate of increase will accelerate. It is not a stretch to target broad 2018 upside of another 15-20% to most markets. *there are just a couple of fed officials on the loose, notably Bullard (Thurs'), and Harker (Fri'). Submit YOUR target for 2018. Primary: what is your end 2018 target for the sp'500 ? Secondary: ANY other issues you'd like to raise, whether equity indexes, individual stocks, GDP, jobs, inflation, oil, gold/silver/copper, bonds. You can even highlight anything socio-political. 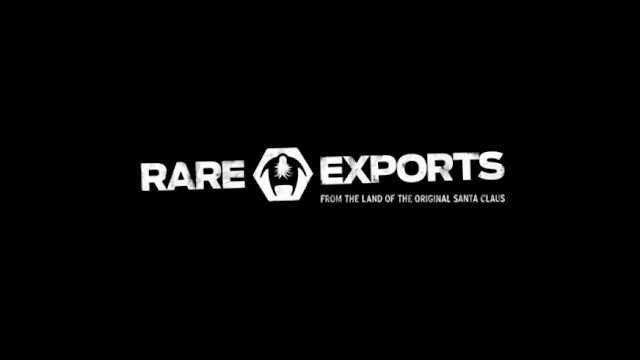 You can submit your target/outlook via Twitter ( https://twitter.com/permabear_uk ), Disqus (in this, or any future post), or email. If you want to change anything, let me know. I will likely post my outlook for 2018, along with your submissions, the weekend of Jan'6/7th. Enjoy the three day weekend... and sincerely happy new year! *the next post on this page will likely appear 6pm EST on Tuesday, Jan'2nd 2018. US equity indexes closed moderately weak, sp -13.93pts at 2673.61. The two leaders - Trans/R2K, settled -0.4% and -0.9% respectively. 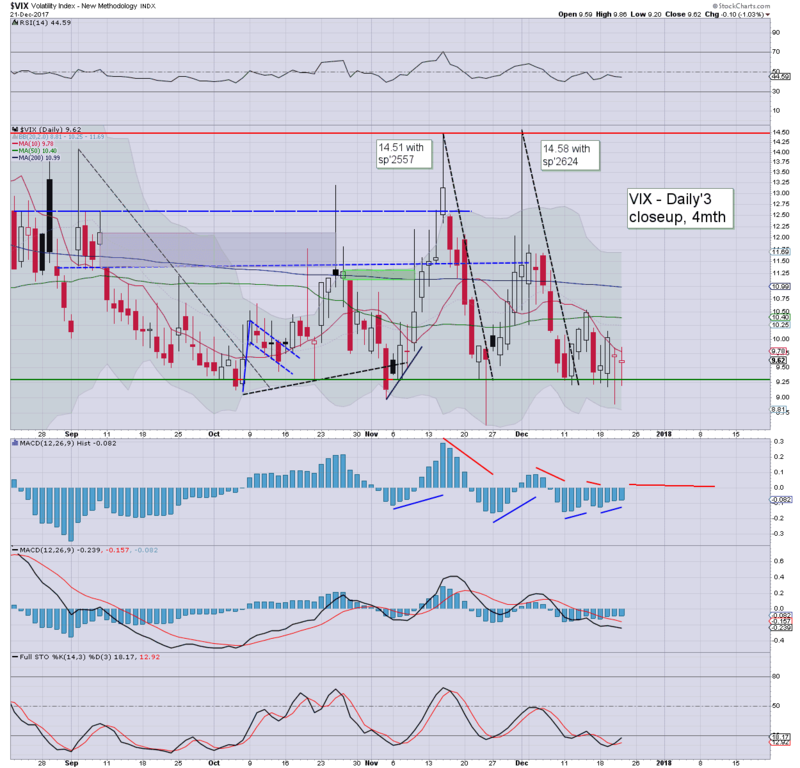 VIX settled +8.4% at 11.04. 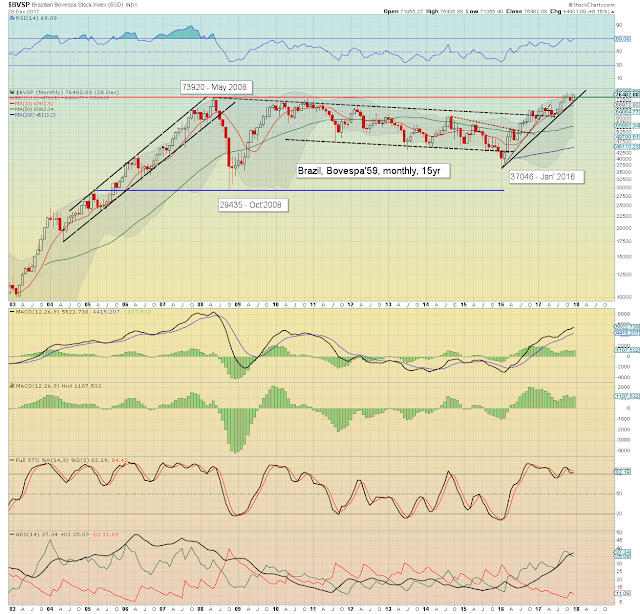 Outlook for January/Feb threatens a mini washout of 3-5%, but broadly, we're clearly headed for sp'3K. In pre-market, the sp' was moderately higher, and offering new historic highs. Yet, as the market opened, the gains quickly failed. Much of the day was just fractional chop. 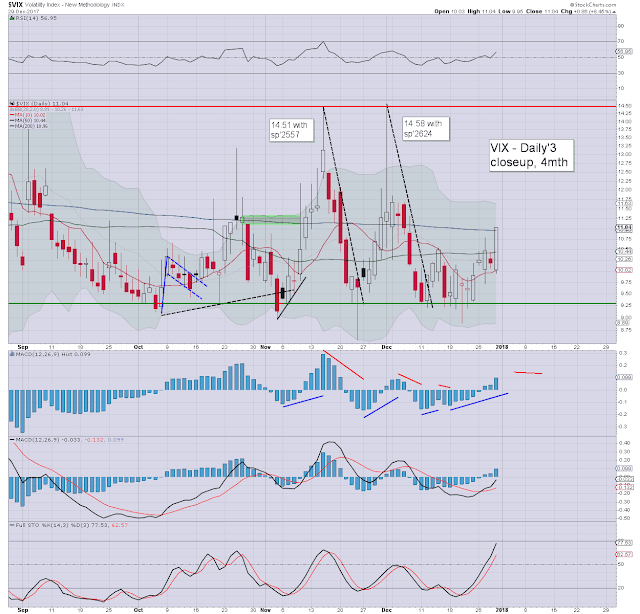 There was distinct weakness in the closing hour, with the sp' settling -0.5% at 2673. 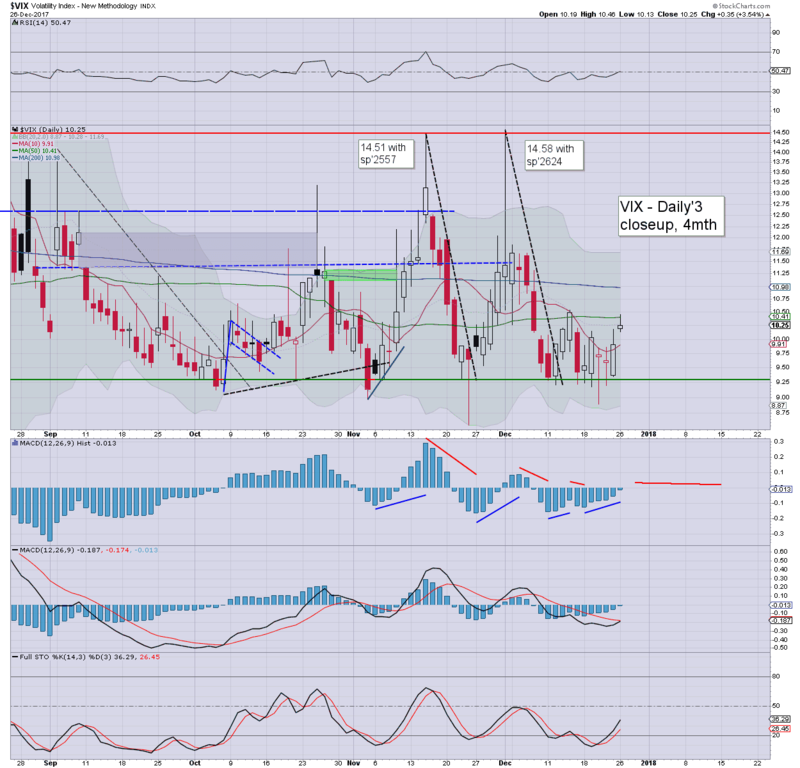 It was a mixed day for the VIX, seeing a low of 9.95, but then swinging strongly higher as equities cooled into the close. Even the most hyper bullish recognise the market is due a mini washout. The only issue is 'when'. 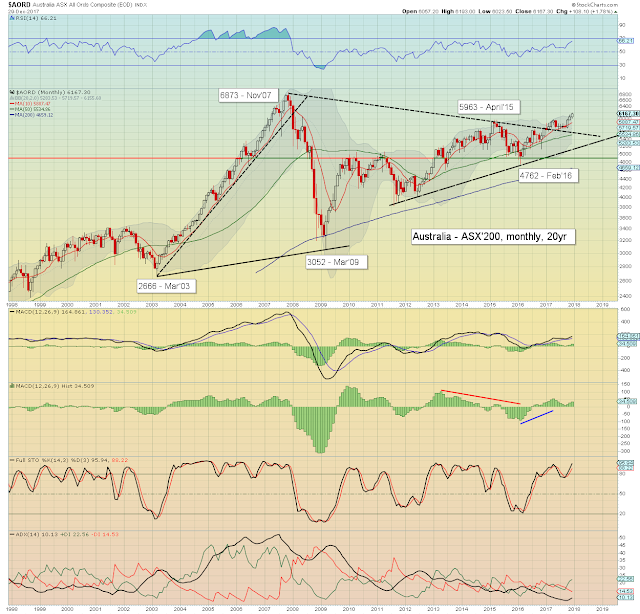 Seasonally, the market is vulnerable from mid Jan-early Feb'. If the bears can't manage anything then, the next realistic window is not until May/June. 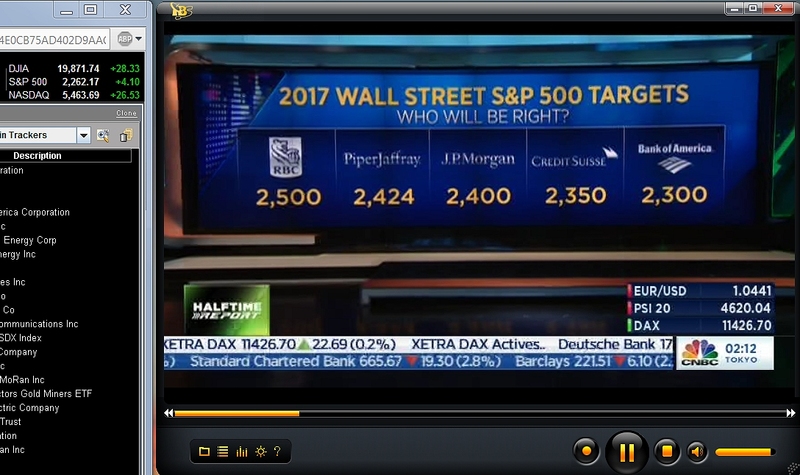 My original year target came to be just 9.39pts (0.35%) above the yearly close, which I'm very pleased with.Yours truly now needs to finalise an outlook for 2018, not just for the sp'500, but rate hikes, and various other issues. A glimpse of sunshine on the last trading day. Bullish! 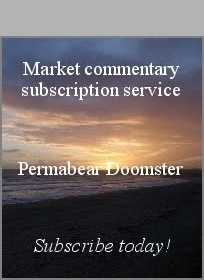 *the weekend post will appear Sat' 12pm EST, and will detail the World equity markets. US equity indexes closed fractionally mixed, sp +2pts at 2682. The two leaders - Trans/R2K, settled +0.2% and u/c respectively. 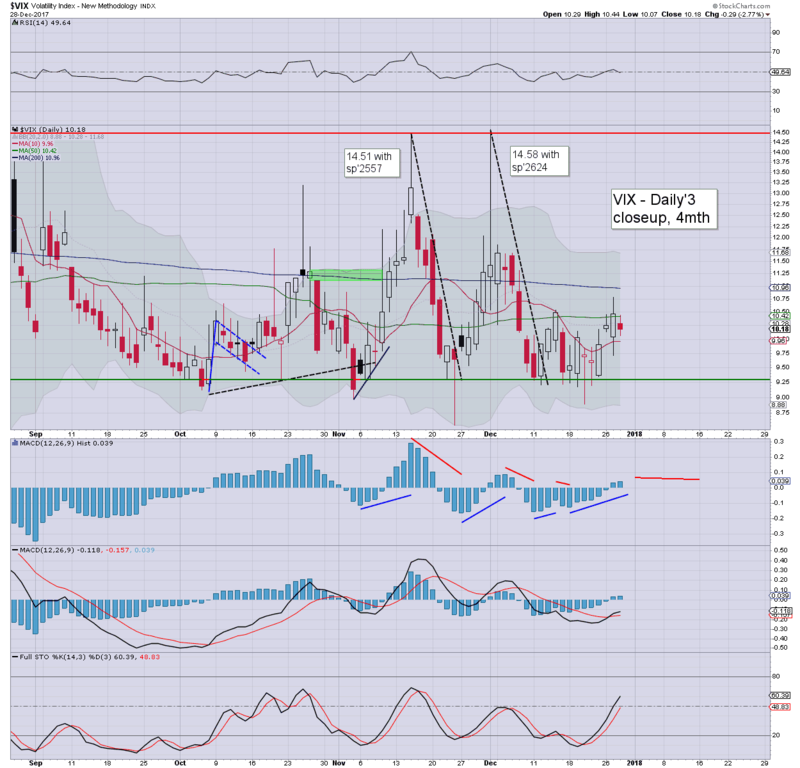 VIX settled +2.1% at 10.47. Near term outlook offers minor chop across the remaining two trading days of 2017. The original settlement target of sp'2683 is set to be mighty close. US equities saw another day of fractional chop. 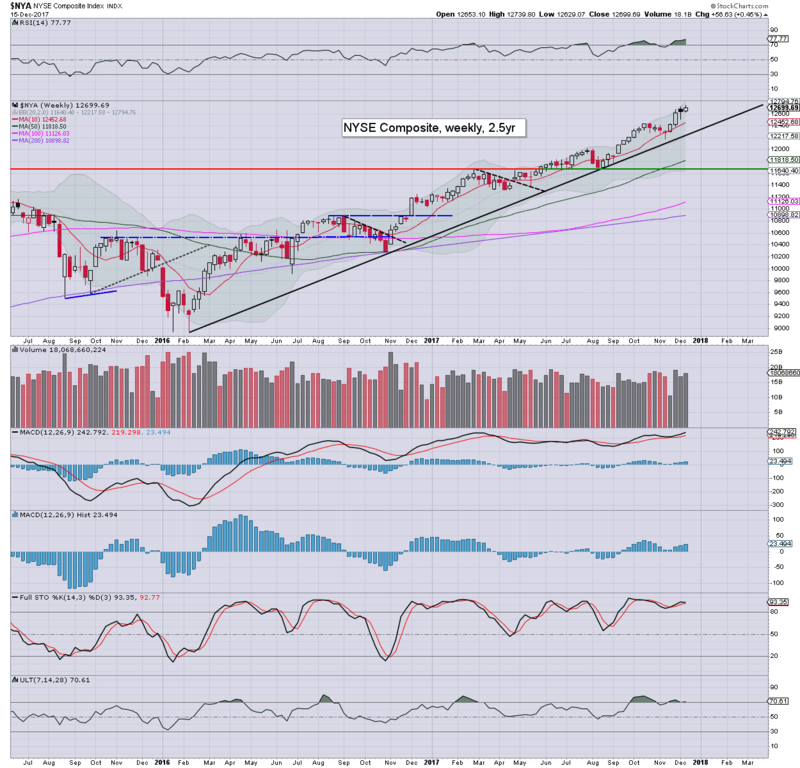 It was notable that the NYSE comp' broke a new historic high of 12834, making it a day for the bulls. VIX clawed higher for a third consecutive day, settling in the mid 10s. At most, a sporadic burst to the 11/12s is due, but is far more likely next week. The US equity record highs have become part of almost every Trump speech/comment. If he takes credit for the gains, what will happen when the market does (eventually) see a retrace of 5, 10, or 'ohh the humanity' 15/20% ? 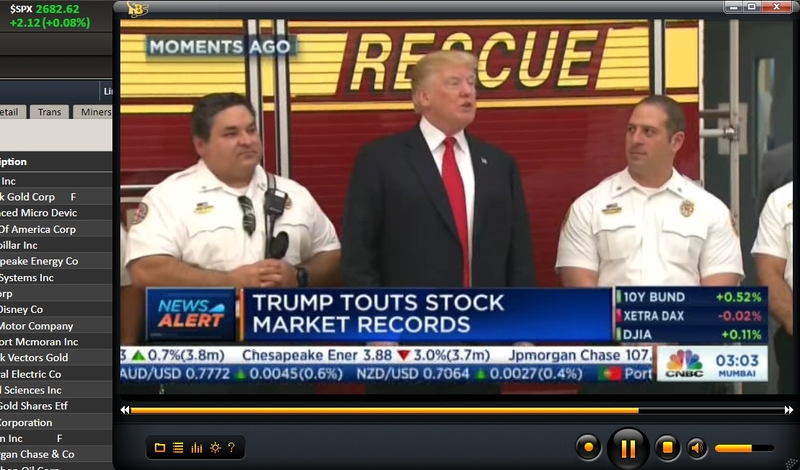 For those that regularly watched the campaign rallies across 2015/16, they should be well aware of how Trump is contemptful against the shortside traders. Do not be surprised if he comes to blame them for any 'drama' in 2018. 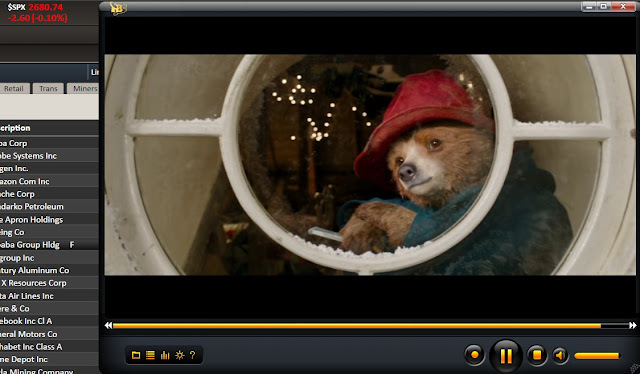 ... and there is always Die Hard, Gremlins, and Its a Wonderful life. *Don't forget to submit a number/outlook for 2018, although I recognise most of you will wait until after the last trading day of the year. 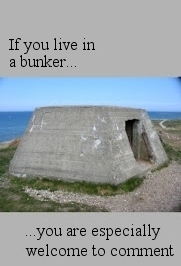 See previous post for details. 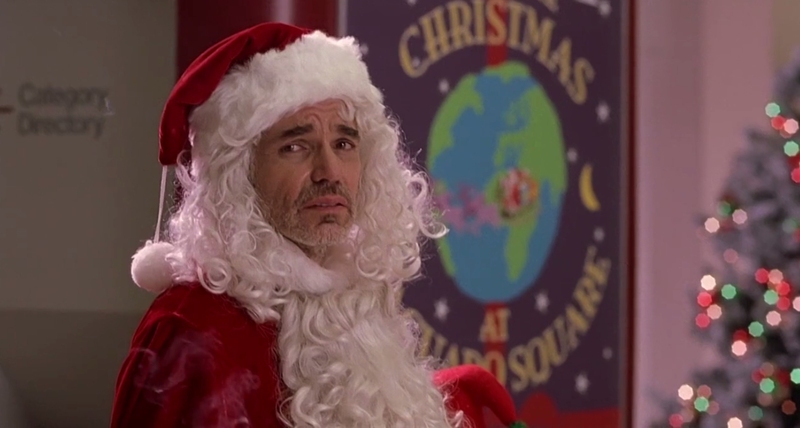 *the next scheduled post is Tuesday Dec'26th at 6pm EST. 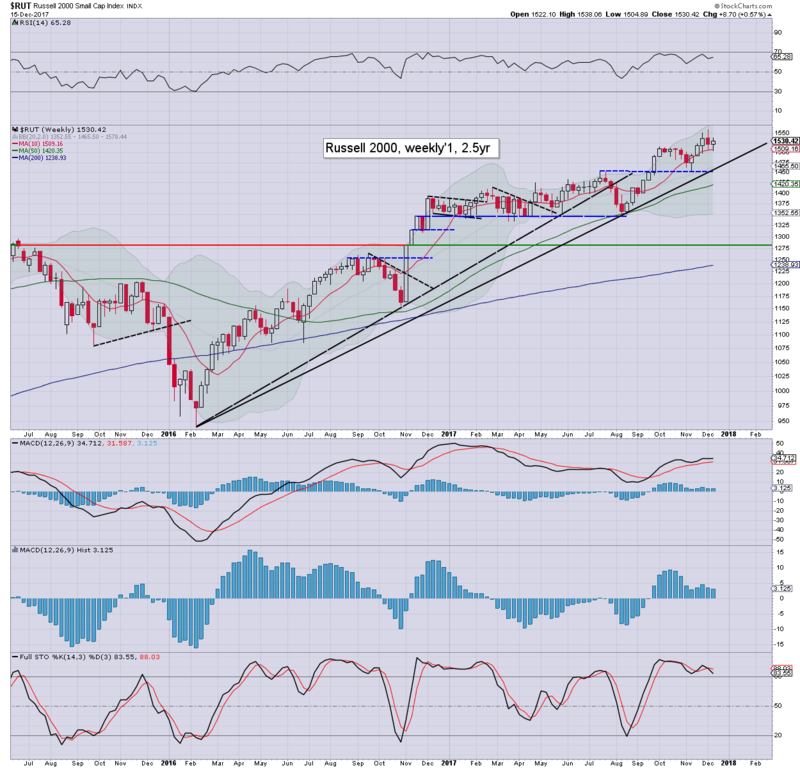 It was another bullish week for the US equity market, with the sp'500 net higher for a fifth week, +7pts (0.3%) at 2683, with a notable new historic high of 2694. 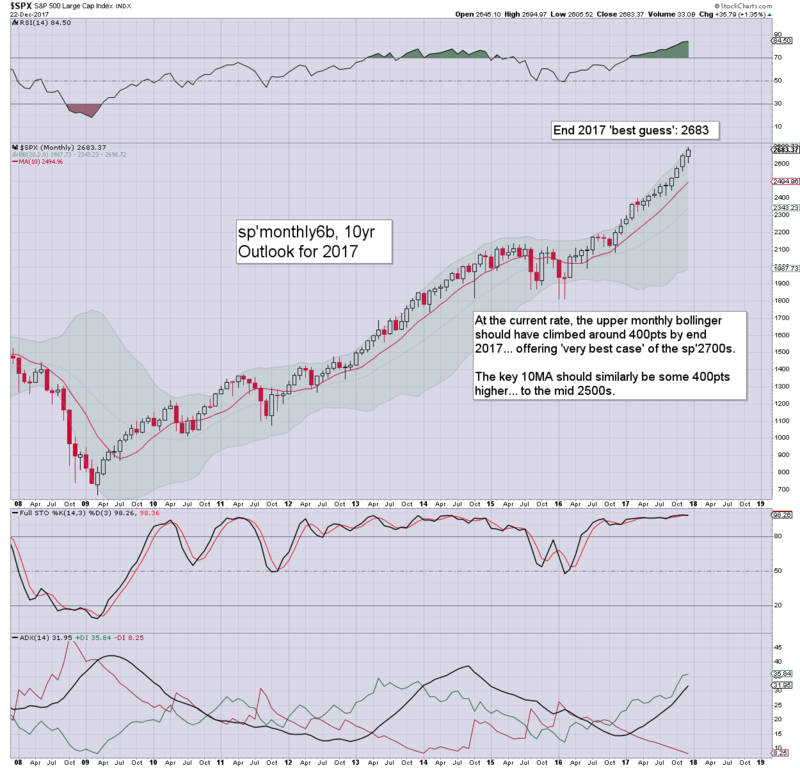 Near term outlook offers some chop into year end. 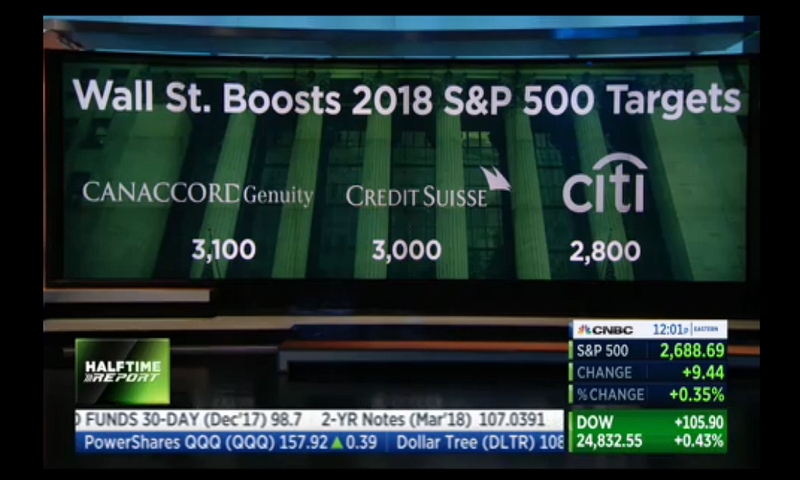 More broadly, even the mainstream now recognise sp'3K is on the menu for 2018. Of the six indexes I regularly highlight, five broke new historic highs this week. 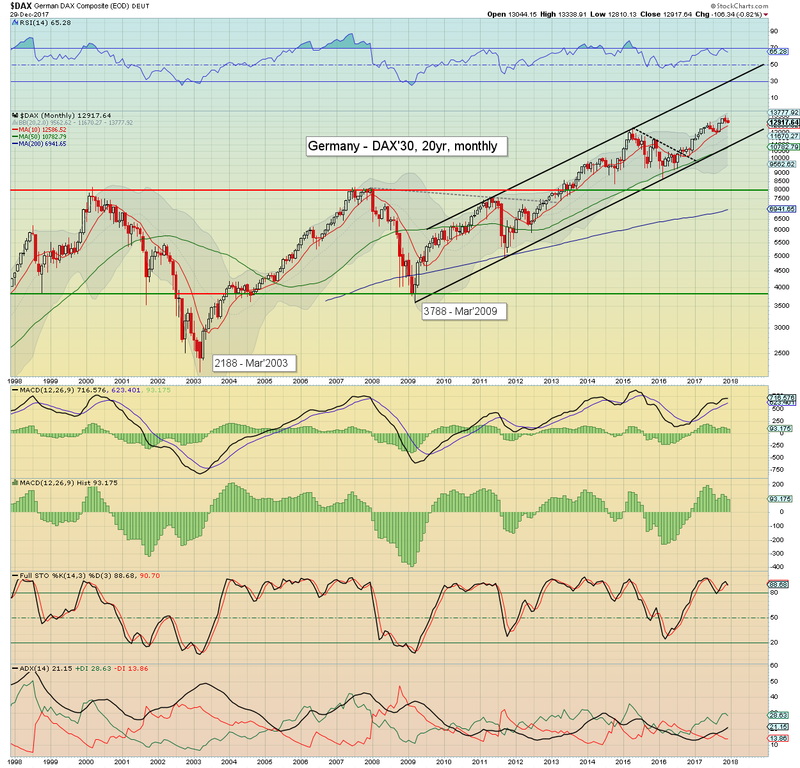 Only the R2K missed out, but even that remains very close to recent highs. Cyclically, we're on the high side, and the market does look vulnerable in the seasonally weak period of mid Jan-early Feb. At best, there seems a viable threat of a 5% washout, before quickly recovering, and pushing onward to challenge the 3K threshold by mid year. *As Friday is the last trading day of 2017, there will likely be some very significant tax-loss selling in select stocks (GE being a prime candidate). 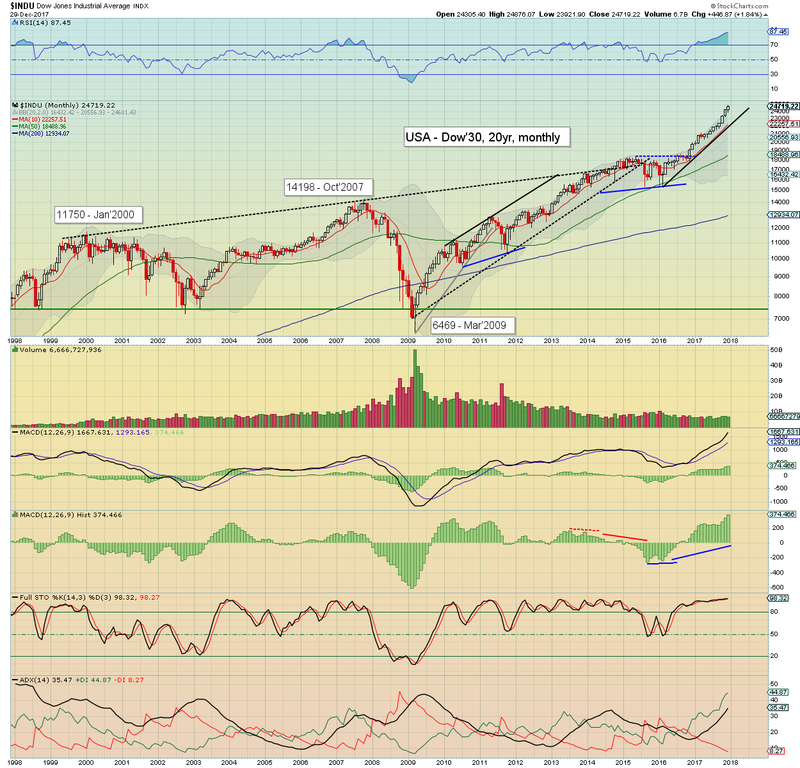 **Keep in mind, the following Monday, Jan'1st, the US market will be CLOSED. 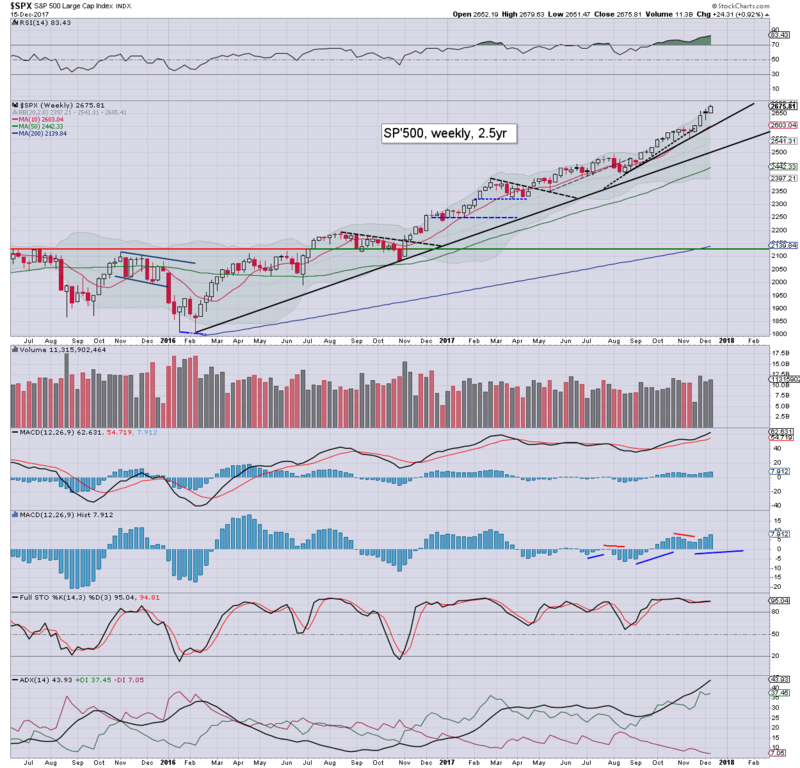 At the start of the year I provided a year end target of sp'2683. 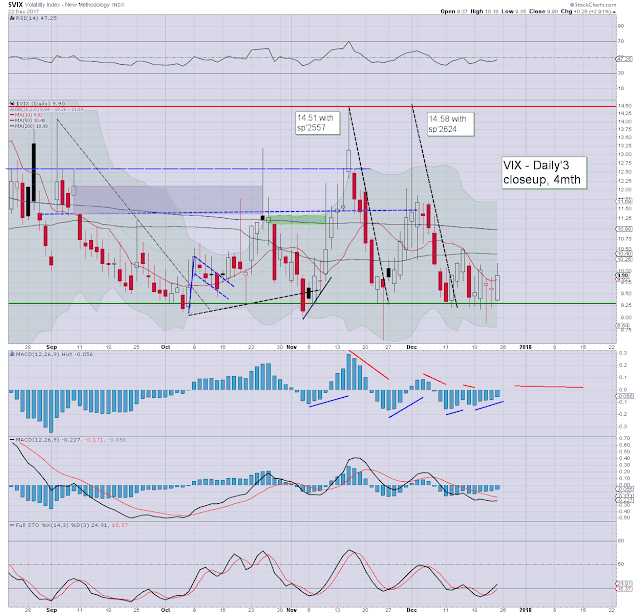 Its notable that this week closed precisely on target, and now its a case of exactly how the year settles. I'll be very pleased with anything +/- 26pts, which does seem probable. I'm still trying to narrow down a broad range to a specific 'best guess' target, along with some broader issues (such as rate hikes, growth). Now is YOUR opportunity to submit your outlook for 2018. Secondary: ANY other issues you'd like to raise.. whether equity indexes, individual stocks, GDP, jobs, inflation, oil, gold/silver/copper, bonds. You can even highlight anything socio-political. 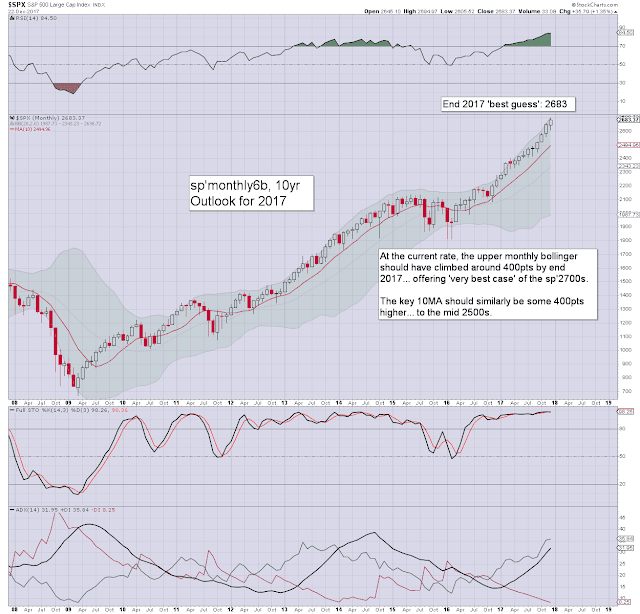 I will likely post a detailed outlook for 2018, along with your submissions, no later than the weekend of Jan'6/7th. 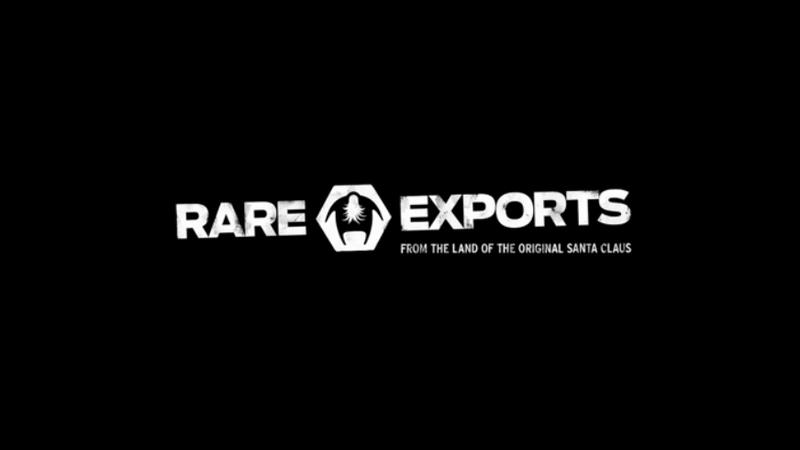 *The next scheduled post will be Tuesday Dec'26th at 6pm EST. US equity indexes closed a little mixed, sp -1pt at 2683. The two leaders - Trans/R2K, settled +0.4% and -0.3% respectively. 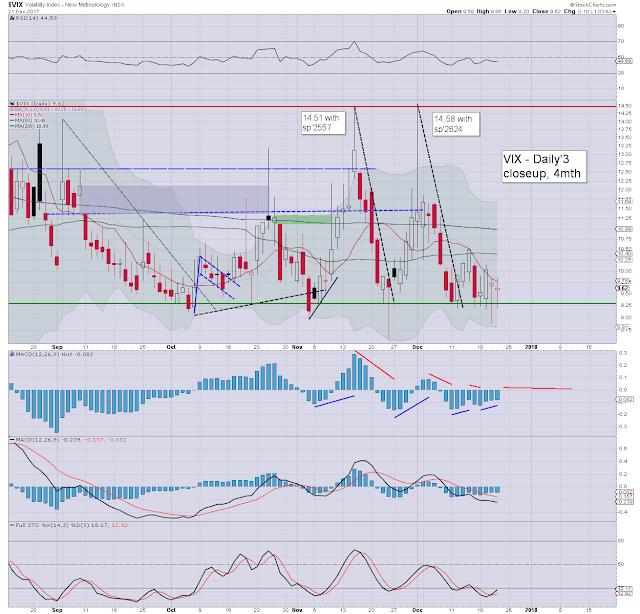 VIX settled +2.9% at 9.90. Near term outlook offers moderate swings across the remaining four trading days of the year. It was naturally a day of micro chop into the Christmas break. Most indexes leaned fractionally weak across the day, but in the scheme of things, it was largely all just 'minor noise'. 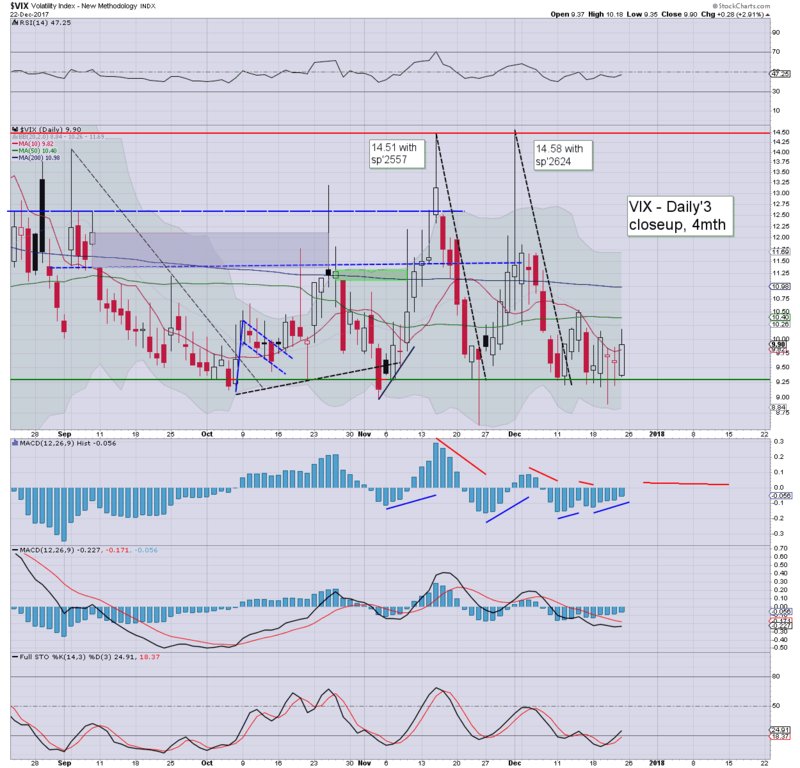 Volatility itself was subdued, with the VIX settling the week in the 9s. 2017 is set to be the first year since 2005, that we've not seen any price action above the key 20 threshold. US equity indexes closed a little mixed, sp +5pts at 2684. The two leaders - Trans/R2K, settled u/c and +0.5% respectively. 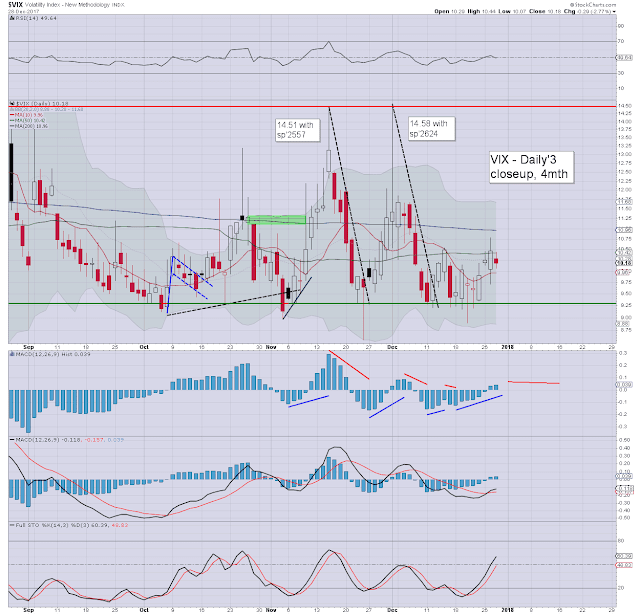 VIX settled -1.0% at 9.62. 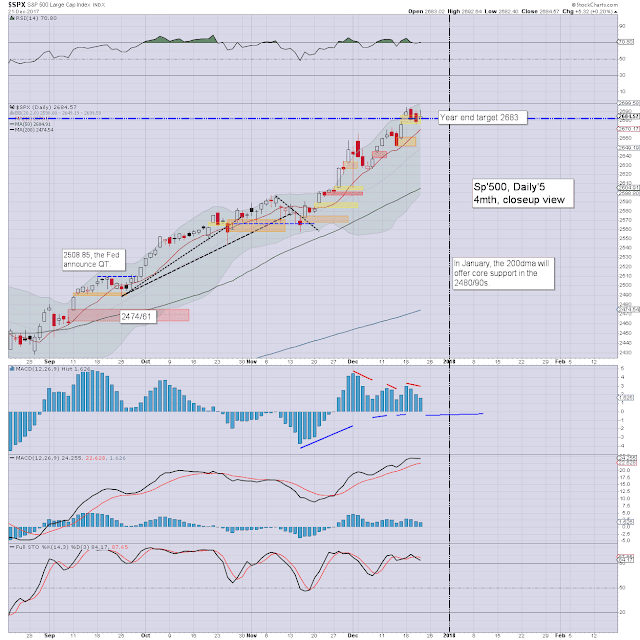 Near term outlook offers minor chop into the Christmas break. 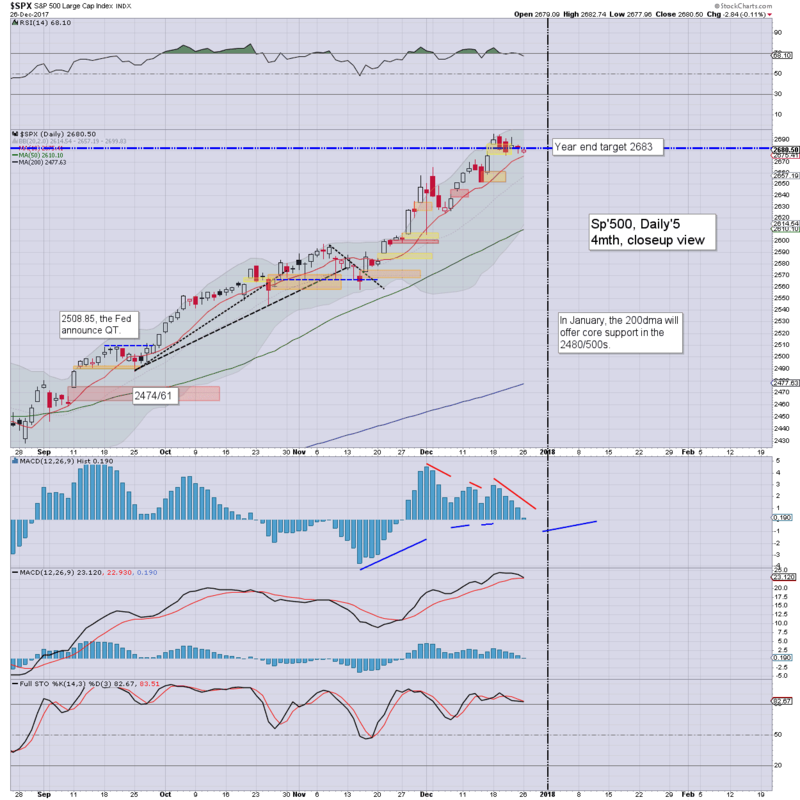 The sp'2700s and Dow 25k seem probable before year end. More broadly, many are now seeking sp'3K in 2018. 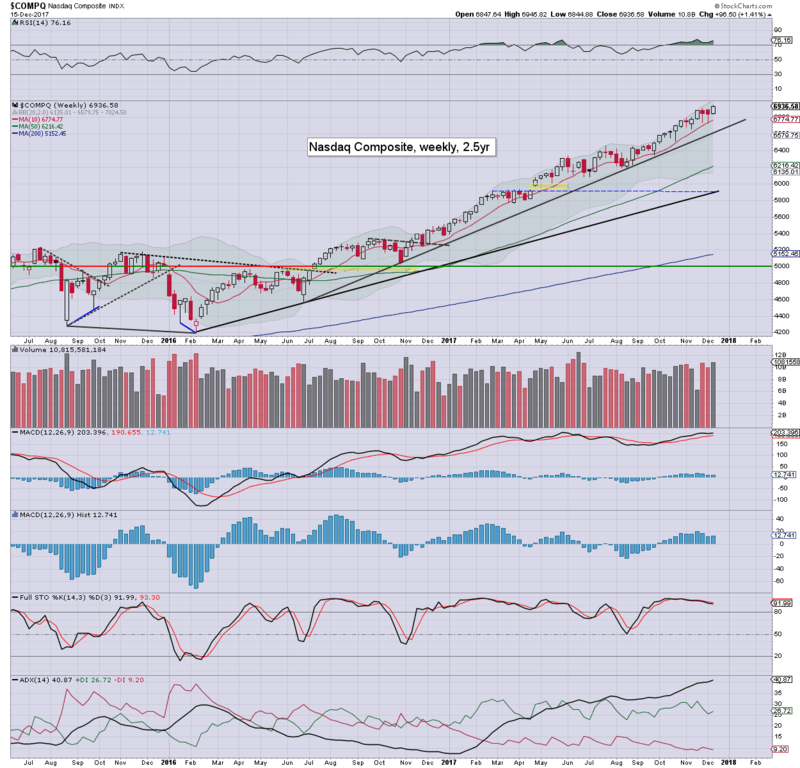 It was a bullish day, as we did see two indexes - NYSE comp', and Transports, break new historic highs. Today was winter solstice, the long crawl into summer 2018 has begun. 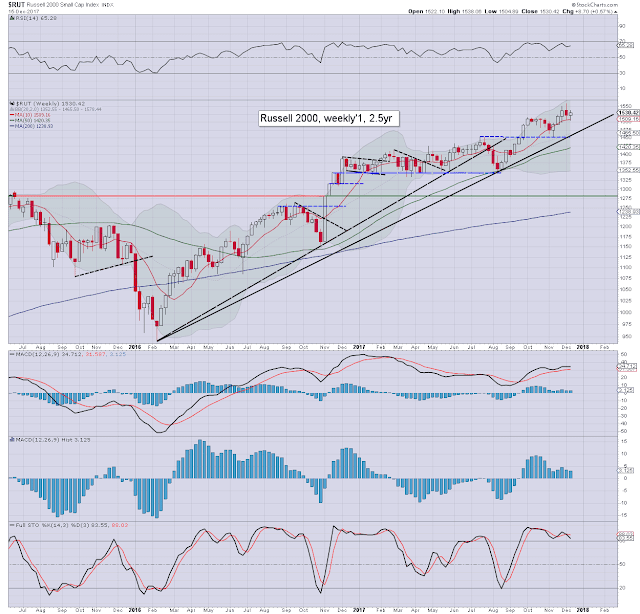 US equity indexes closed broadly higher, sp +14pts at 2690. The two leaders - Trans/R2K, both settled higher by a significant 1.2%. The original year end target of sp'2683 has been hit, with 8 trading days now remaining of the year. 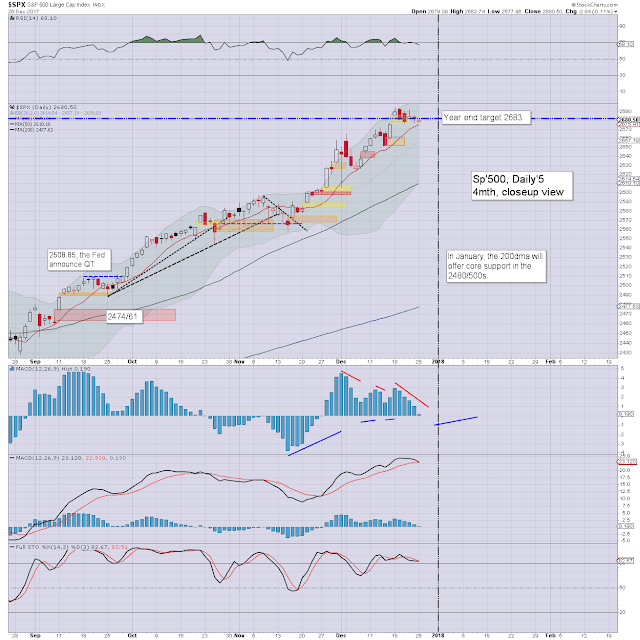 At the start of the year I posted a target of sp'2683. Its been hit, with 8 trading days now remaining this year. Thats all I have to say about that. Good luck with that for 2018 and beyond. It was a broadly bullish week for US equity indexes, with net weekly changes ranging from +1.4% (Nasdaq comp'), +1.3% (Dow), +0.9% (sp'500), +0.6 (R2K), +0.4% (NYSE comp'), to -0.1% (Trans). 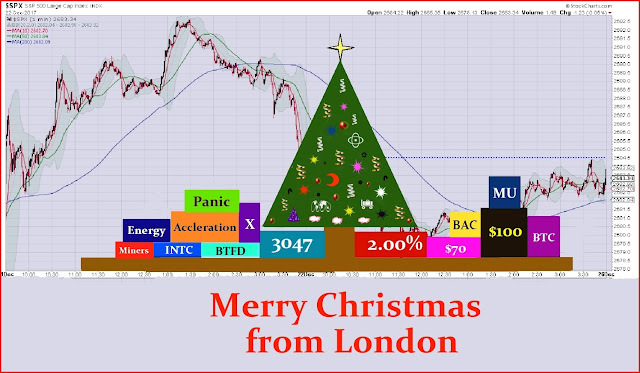 Near term outlook offers a little chop ahead of the Christmas break. The year end target of 2683 is set to be hit. The sp' climbed for a fourth consecutive week, +24pts (0.9%) to 2675, with a new historic high of 2679.63. 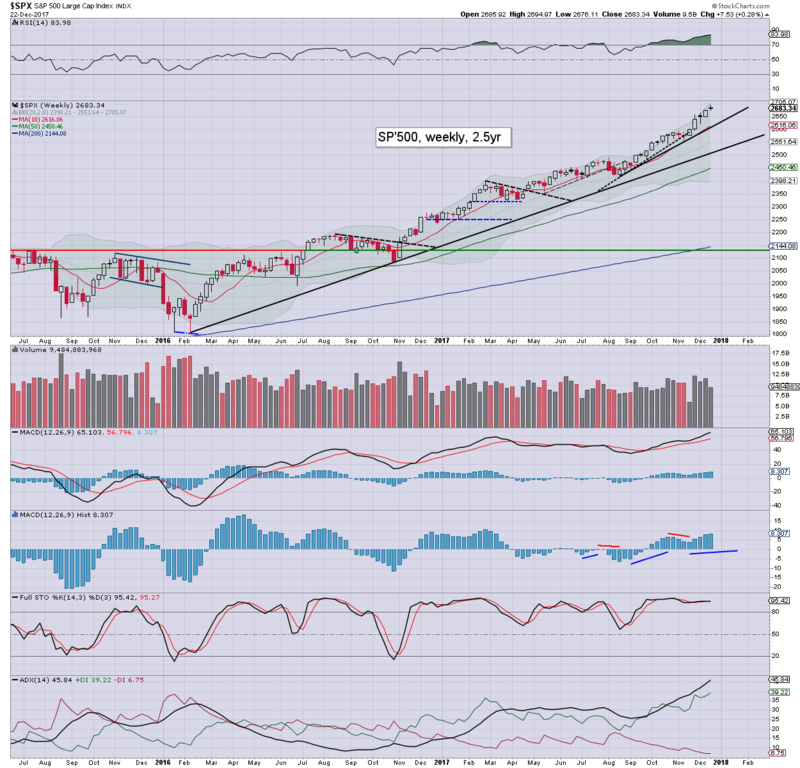 Its notable that the sp' has been net higher for 14 of the past 17 weeks. 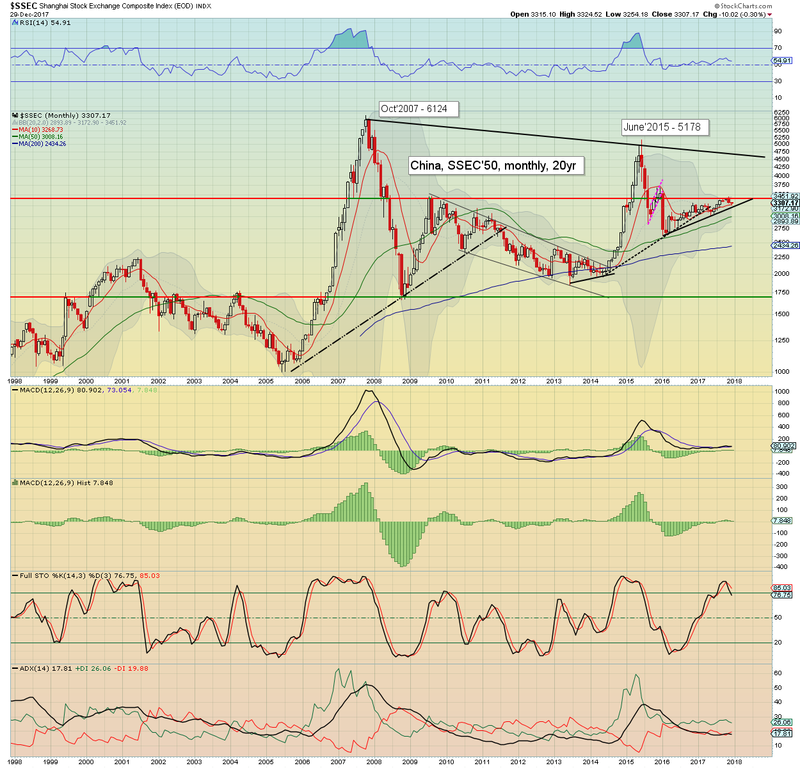 Best guess: a fair degree of chop into year end, settling somewhere within the 2670/2710 zone. 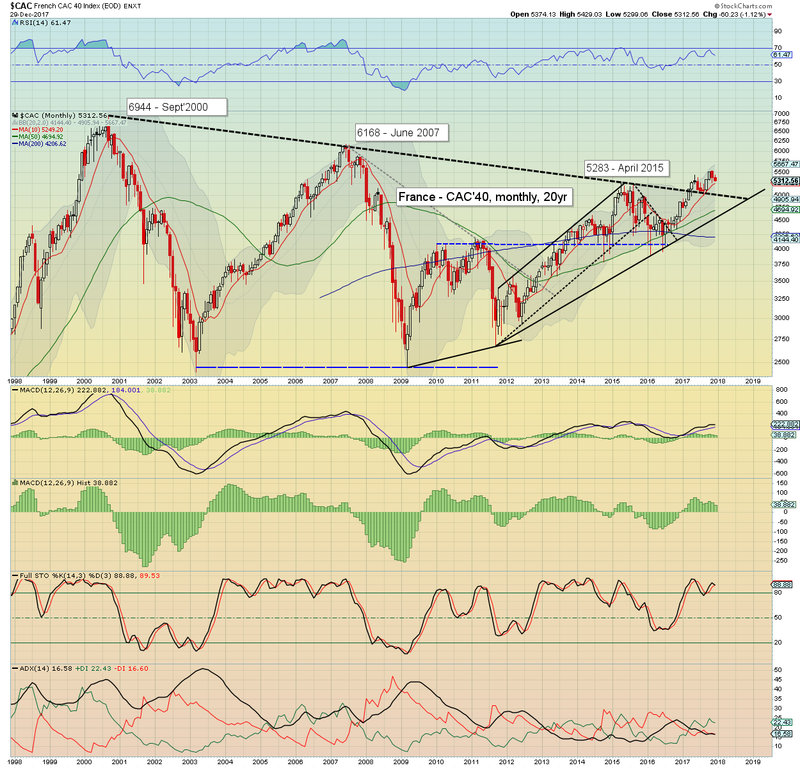 More broadly, sp'2950/3047 is a valid target for late spring/summer 2018. Equity bears have nothing to tout unless a bearish monthly close. For me, this would equate to a monthly close under the monthly 10MA, currently at 2495, and rising by around 25pts a month. So, as of June 1'st, my 'line in the sand' will be somewhere within 2600/2650. 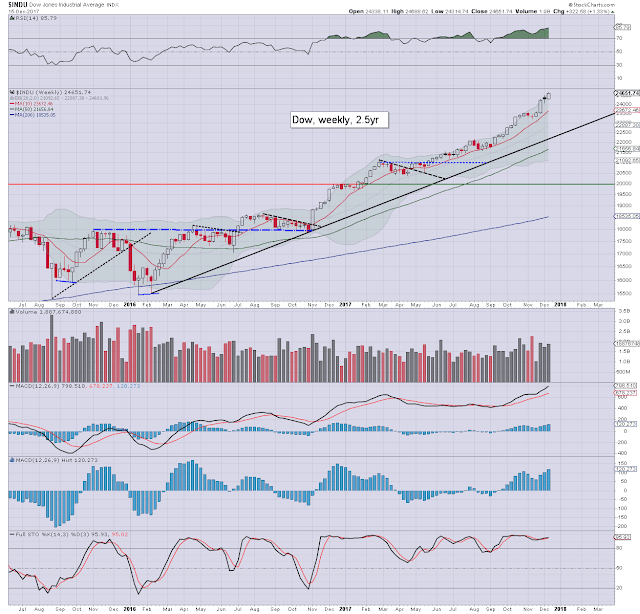 The Nasdaq lead the way higher this week, settling +1.4%, with a new historic high of 6945. The 7000s are clearly due within the near term. The 8000s are a valid target by mid 2018. 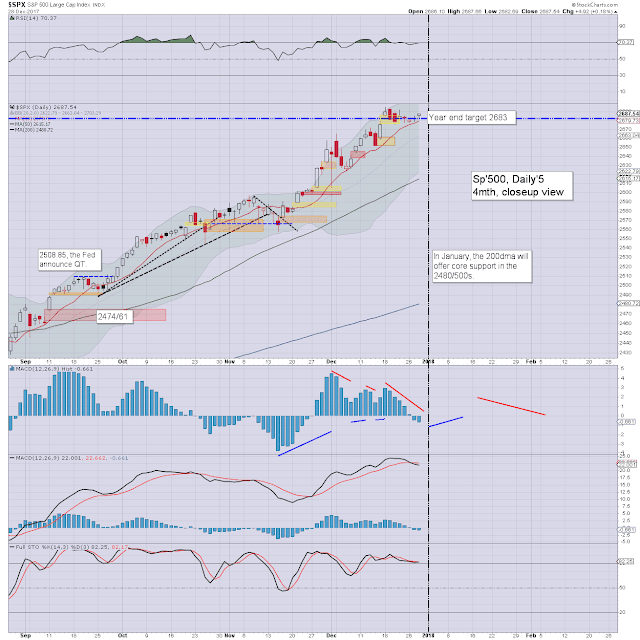 Note core support - from early 2016, is currently around 5900... a rather long way down! The mighty Dow climbed a sig' 1.3%, with a new historic high of 24688. The Dow continues to scrape along the upper weekly bollinger. The psy' threshold of 25k is clearly due, whether just before year end, or in January, it really should make little difference. If you believe in sp'3K by mid 2018, that would arguably equate to Dow 26500/27250. 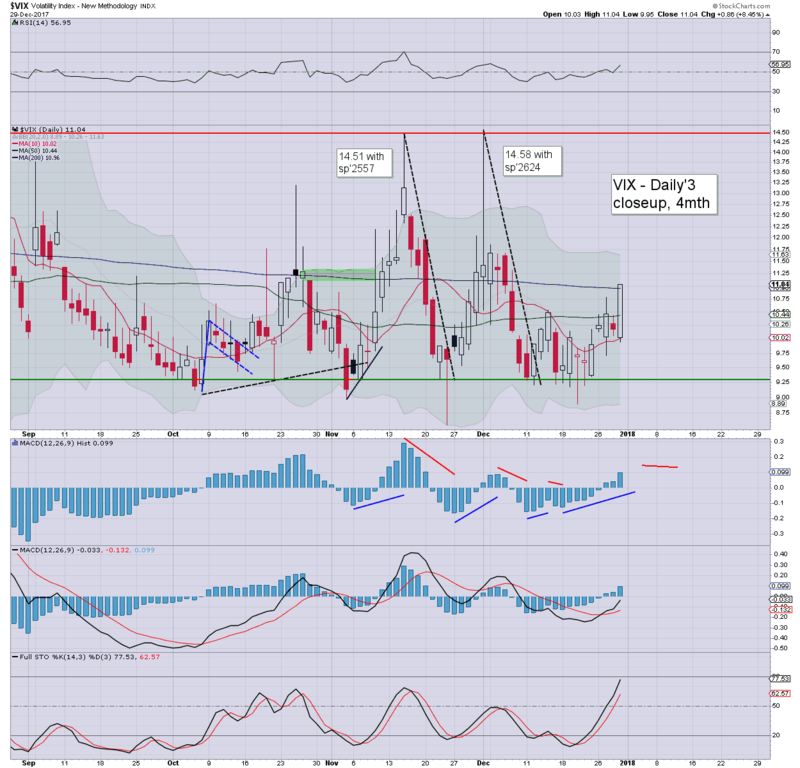 The master index settled +0.4% to 12699, with a notable new historic high of 12739. The 13000s are clearly due in early 2018. Core support in mid January will be around 12400.. which looks secure. 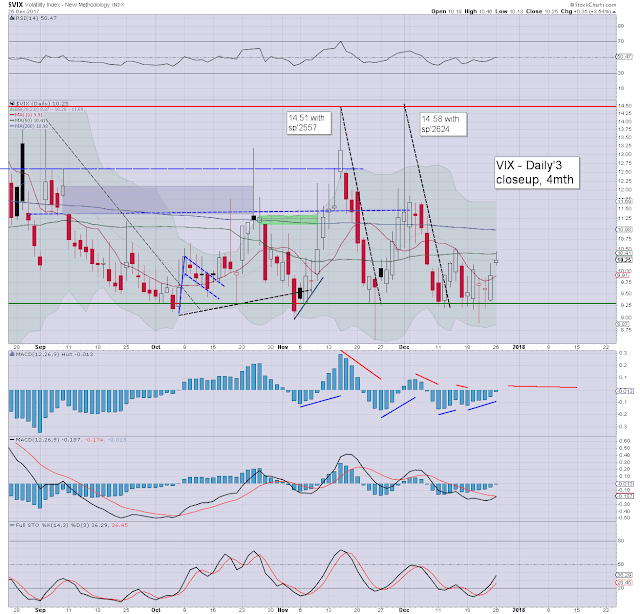 The second market leader - R2K, settled +0.6% at 1530. New historic highs (>1559) look viable before year end. More broadly, 'R2K at 2K' is a valid target for late 2018. 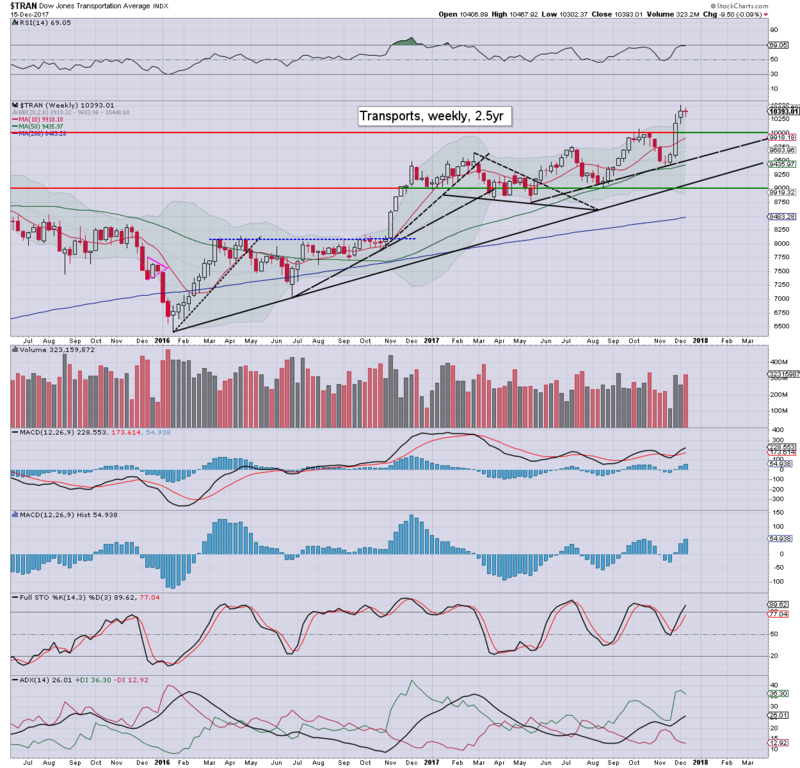 The 'old leader' - Trans, was the laggard this week, settling -0.1% at 10393. A yearly close >10k looks a given. The 11000s are due in the spring. The hyper bulls should be seeking 12500/13000 for 2018. 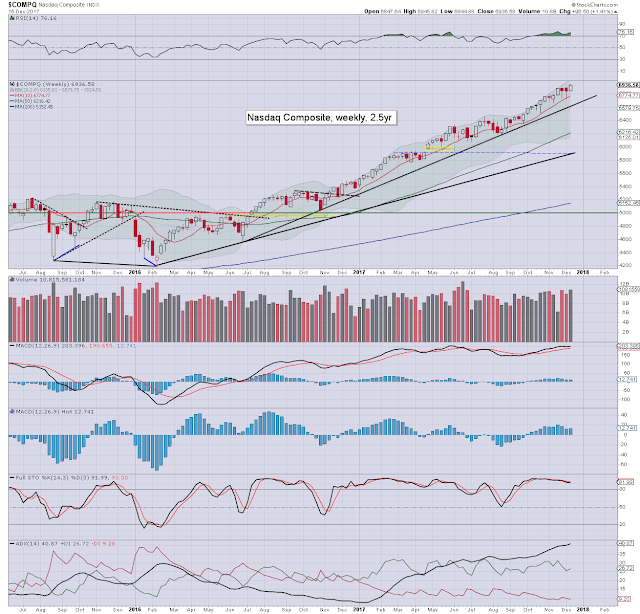 A bullish week for the US equity market, with four indexes (sp, dow, nasdaq comp', nyse comp') breaking new historic highs. All indexes have at least 3-4% of downside buffer, before core support - from early 2016, would be challenged. Equity bears have nothing to tout, unless a majority of indexes break and see a monthly close under their respective monthly 10MAs. That does not appear likely for at least another 5-6 months. For those expecting a sig' retrace in 2018, look to the time frame of Aug-Oct'. With nine trading days left of the year, Nasdaq comp' is currently +28.9%, dow +24.7%, sp' +19.5%, with the R2K trailing, but still a very respectable +12.8%. A light week is ahead. It will be the last full trading week until Jan'8th. *As the following Monday is Christmas day, Fri'22nd can be expected to be extremely subdued, closing normally at 4pm.